A cool fresh morning with a bit of drizzle we left the hotel in Okayama. 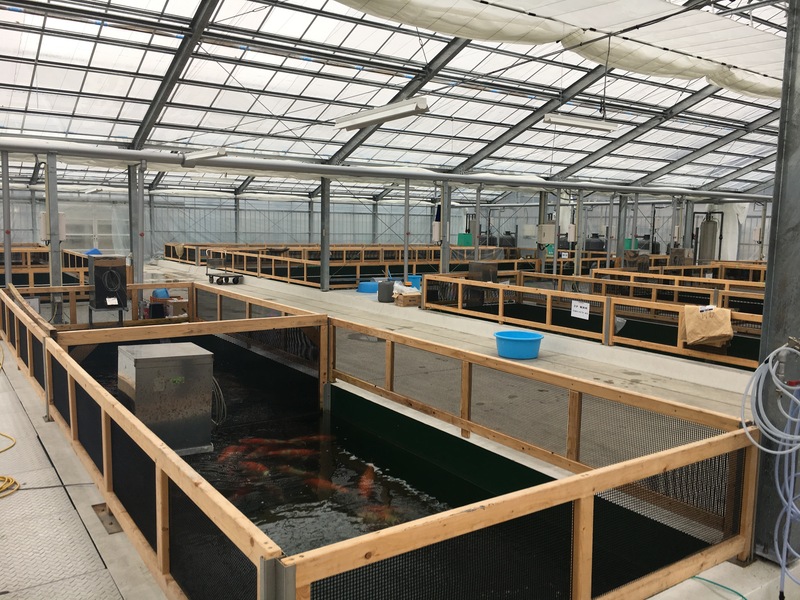 It was time to head to Momotaro Koi Farm. A quick stop for breakfast and within half an hour we arrived. 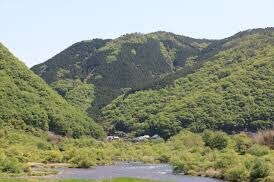 The farm is situated right next to the Asahi River, with the picturesque rolling hills as a back drop, it’s always a refreshing sight to see. Heading straight into the koi house we saw member of staff Adam doing some maintenance on the ponds. Greeted by Adam he took us to where our koi were. First we went to see our Sanke and Showa which reside in the same pond. These were purchased by us late 2014 and have been at Momotaro since. 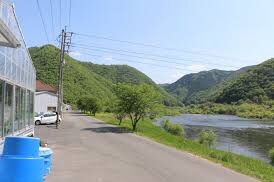 Purchased as Nisai they are both now Yonsai. Both looking in wonderful condition and looking to be somewhere between 75cm and 80cm. Not ideal but all of these ponds were being fed so it wasn’t possible to bowl the koi but from what we could see in the pond they had come on really well over the winter period. Here they are as of Autumn 2016, from what we could see, they had both bulked up slightly and also the sumi has become more refined. The Sanke will be arriving home soon. The Showa will stay in Japan for the time being. 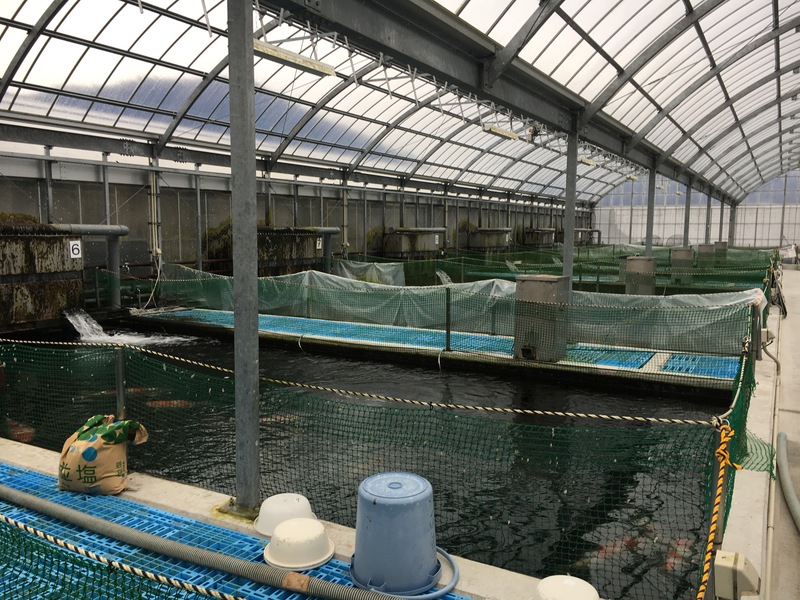 Into the brand new fish house we went where our Gin Rin Kohaku was kept. Again, this koi has developed tremendously well. This koi won Best in Variety at the ZNA All Japan show late last year, also 1st 75bu Gin Rin A. The suitcase is slightly heavier now with the trophy ! Picture as of early 2016 when it attended the All Japan Young Koi Show, at the time it was 62cm. Now she is close, if not over 75cm and Sansai ! Last of our Azukari koi here we managed to find our Tancho Kohaku, as you can imagine it can be hard to distinguish Tanchos from one another. Especially when they are swimming in a pond with murky, foamy water. This Tancho is now around the 62cm mark and again in fantastic condition. Picture below shows her early last year when she picked up an award at the All Japan Young Koi Show. Video of her is in the pond at Momotaro today. Wandering around the farm we had a close look at some of the Tosai ponds. Many of the better quality Go Sanke Female Tosai hadn’t been through their final selections yet and the male Koi on offer didn’t take our fancy. We did however come across a pond full of Gin Rin Benigoi. We have dozens of requests for these so we managed to select through the pond. 12 Tosai Gin Rin Benigoi selected from the pond. I’m sure our customers will have great fun growing these. 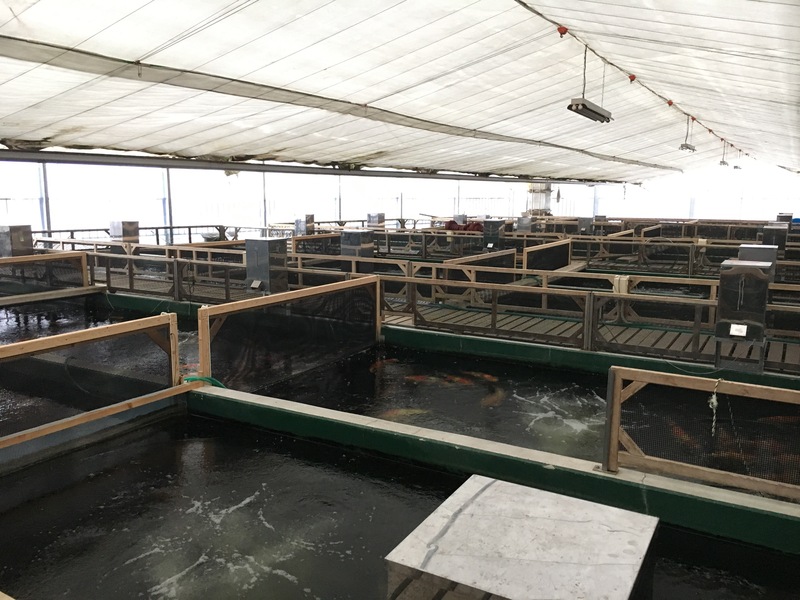 Moving on from Momotaro we drove to Sakai Fish Farm, only an hours drive away it started to bucket it down. Such a miserable day ! At Sakai we have 7 koi. All but one purchased last year. Now a year on we got to bowl all of them up and have a good look at them. Pulling in to Sakai you really see how big this place straight away, looking across the outdoor raising ponds throughout the valley there is a 360 degree view of koi houses. This place is mammoth! No photos I’m afraid but plenty of videos. 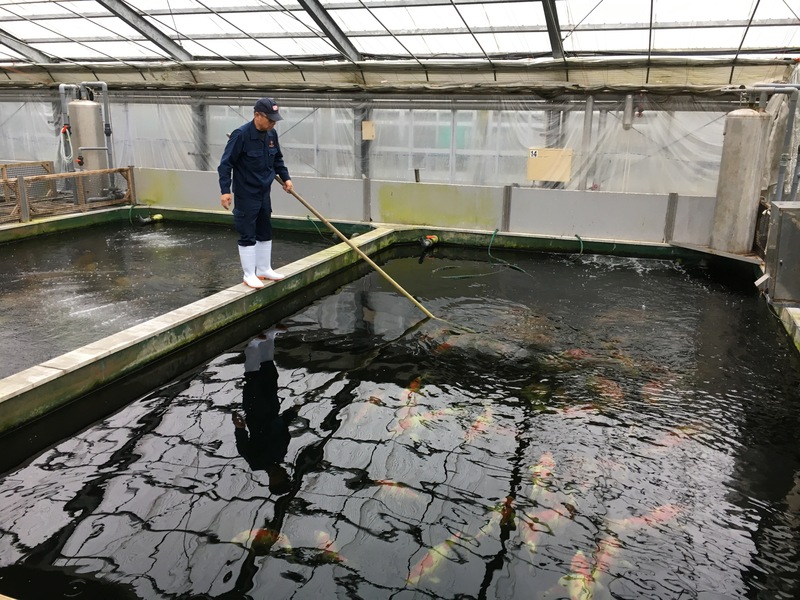 Matsuura-San was a bit hesitatant bowling them outside of the pond due to them just being treated with medication or they were ponds that were heavily fed so they bowled the koi in the pond. Starting with two rather special koi, our Maruten Sanke purchased as Tosai this is now Nisai and in excess of 60cm. Mind-blowing body, pattern, skin, sumi placement, everything. This certainly made the rainy miserable day a tad brighter. Next onto our Sansai Kohaku aptly named Zig Zag, nickname given to it by Narita. 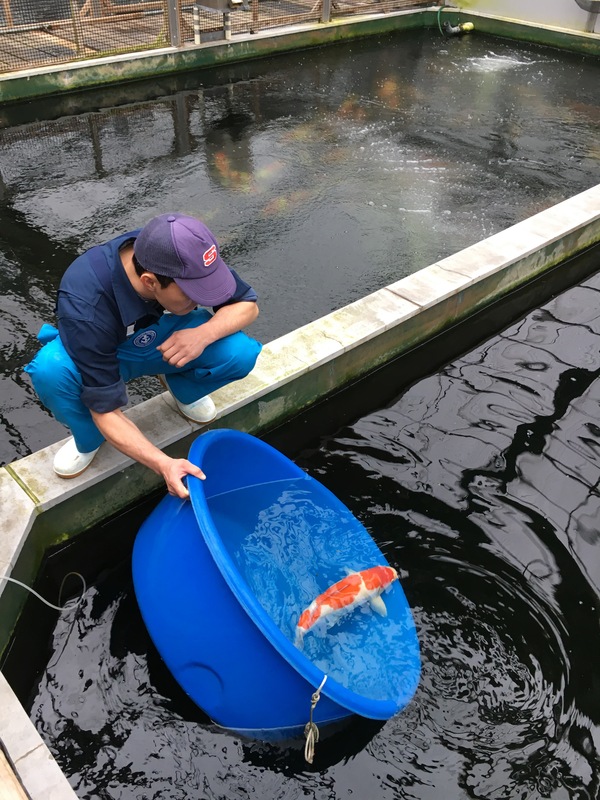 We bought this koi in Spring 2016 as Nisai. Simply breathtaking. She has sailed through the 70cm mark. Ridiculous potential with this koi and it’s getting better all the time. What size will she reach I wonder ? 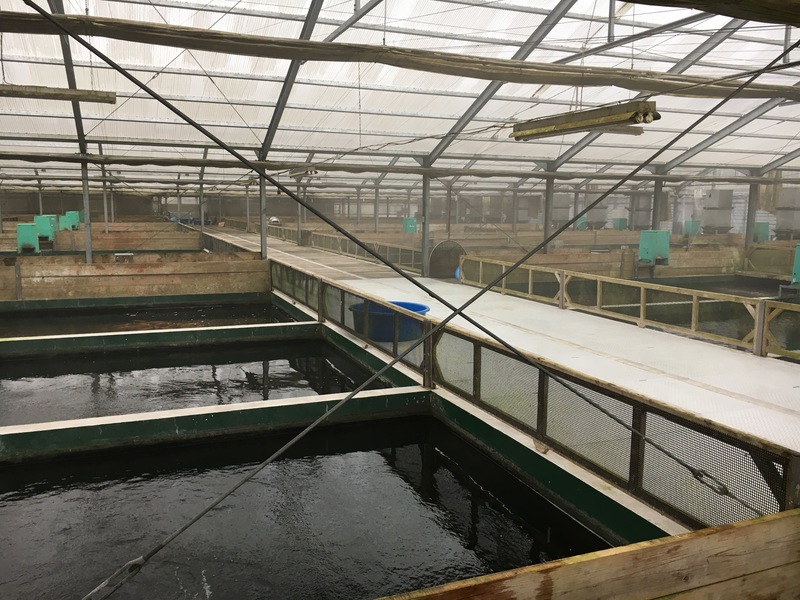 The two koi above will be staying at Sakai for certainly another year, and unfortunately won’t be gracing our new premises anytime soon. Maybe next year ? A sneaky under the radar purchase earlier in the year, we saw our Sansai Kohaku for the first time. What a beast! 68cm and Sansai, offspring of Chagall. Looking gorgeous. Can’t wait to get her back to the UK in a months time and continue to push her. Only 2 and a half years old and 68cm, she’s a battleship. 4 other koi we have at Sakai are looking really good too. Mixture of Nisai Sanke and Kohaku. Darting around the farm driving back n forth between the different koi houses we located all of our koi with the help of Matsurra San. 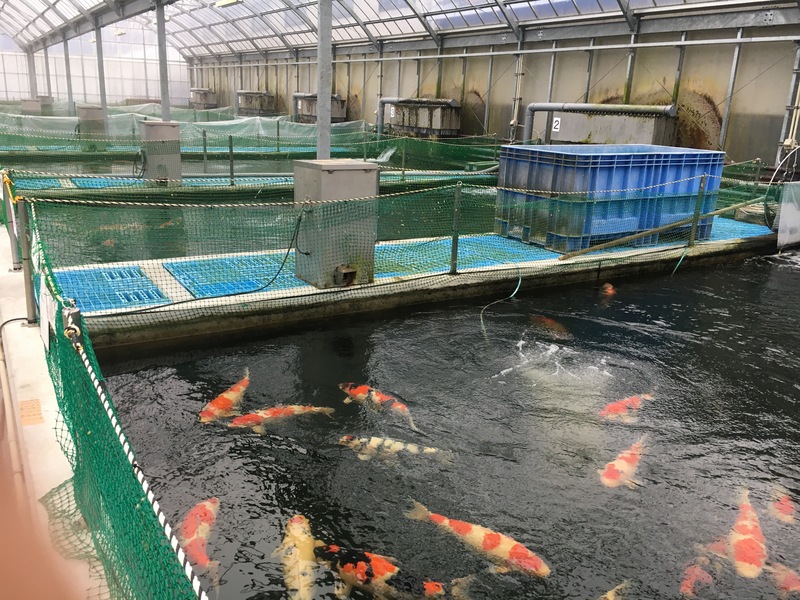 These 4 koi along with the Sansai Kohaku will be arriving back to the UK in the coming months. 7 out of 7! Great result with our Azukari Koi at Sakai. Below are some videos. Leaving Sakai Fish Farm we popped into a 7/11 and picked up lunch, then hit the road to go to Omosako. Day II to be continued….